Lyndon Johnson’s speechwriter and sounding-board Busby offers insight into the blustery Texan’s personality, politics, and work habits. As a politics reporter, Busby first got to know Johnson in the late 1940s—and what a sight Johnson was, unafraid and decidedly unrefined. Busby recalls some memorable run-ins when then junior politician Johnson confronted the Texas Establishment, as when he told one ranch-and-oil Austin patriarch (whom Busby nicely characterizes as “never bullish on the twentieth century”), “Your brain has been clogged up for thirty years . . . and it would be a service to the city if you poured in a can of Drano to open it up.” To a constituent worried that funding an all-black college would make the rest of Texas’s African-Americans get big ideas, Johnson replied that he had to leave in order to get back to his office before the check went out—so that he could double it. The Texas governor at the time was resigned to Johnson’s ways, remarking, “If Lyndon would only learn that politics is the art of compromise . . . he would make life so much easier for himself—and all his friends.” If Johnson was not keen on learning that art, he was certainly keen to study great predecessors. 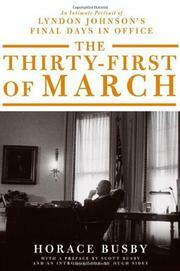 One of Busby’s charges as a White House advisor was to put some polish on the president’s public persona; he recalls, for instance, that LBJ left a stack of 37 books on Winston Churchill on his desk with a note instructing Busby to “be my Churchill.” Busby tried, pitching in on resounding State of the Union addresses and other speeches that doubtless would have been sweeter to the ear had riots and wars not crowded them out. Busby’s account of LBJ in his last months in office is affecting: he depicts a tired old man worn out by his office, barely holding on in a besieged city and a country torn in two, yet steadily keeping to a 20-hour-a-day schedule. A minor but welcome addition to the literature of the Johnson White House.